facing hardships due to the move. One couldn’t believe Murderer of democratic institutions (Modi) OPENLY TALK of Giving PAINS to JUST ANY BODY – Not Once But Repeatedly. Paper Ballots which is being used by 80 democracies of the world till entire EVMs are replaced. Ms Mayawati’s BSP won UP Panchayat elections with paper ballots while it lost in the 2014 Lok Sabha elections because of these fraud EVMs. Retail Prices of FOODS & Pulses DOUBLING – Besan Selling At Rs.200 Per Kg. DON’T FORGET ALL PAINS Of the Fraud EVMs till they are replaced by Paper Ballots. ‘Nation’ ‘purified’ of black money and fake currency? Only Or Level With Nepal. sent to Ahmadabad & Azadpur Mandis. Farmers Get Rs.22/kg for Ginger. to importers is Retailed for Rs.2,400 to Rs.3,200 Depending on Brand. RETAILERS – So that MULTI-CHAIN Marketing Stays As It Is. The Murderer of democratic institutions (Modi) has rushed into a decision that is poor economics and will ultimately prove to be poor politics too. conclusion that it is nothing less than an unmitigated disaster. Here are 10 of the most prominent reasons why I say so. both by facts and reasoning. with it does not mean taking down the mammoth black economy. counterfeit currency is quite insignificant. total budget outlay of ₹19.7 lakh crore as announced this fiscal. about ₹400 crore of fake currency? least a rumour of what was to come—had already reached several ears. information of the action may well have leaked. purportedly remove about ₹400 crore of fake currency? reducing the efficacy of the eventual demonetization. economy since the roots of it remain untouched. The government is visibly unprepared for the move. presence of mistakes), the task of counterfeiting will become easier. roughly half the space they needed earlier for their ₹1000 notes. Thus, in this sense this move will give a boost to black economy. 9. Where is the infrastructure for a cashless economy? The argument that the move will spur a cashless economy is flawed . How does replacing ₹1000 notes with ₹2000 ones help make the economy cashless? to the move creating extreme chaos. queues at the banks and ATMs . with the most marginalized suffering the most. Mayawati said Modi should stop the “emotional blackmailing” of the people on currency ban. hardships due to the move,” she said in a statement issued in Lucknow. Pradesh, Punjab and Uttarakhand Assembly polls”. “The common man is facing a lot of problems due to the decision. They have to stand in queues to get their own money. Businesses have come to a standstill and the people are hassled due to the chaos prevailing in the country,. Earlier in the day, Modi had said he had left his village and family for the sake of the country. an anarchist group that scheduled an 8 p.m. rally at Holladay City Park. interest of Sarvajan Hitay Sarvajan Sukhaya. The demonetisation of Rs 1000 & Rs 500 notes is pulling India into chaos. A newborn died in a hospital in Mumbai after the hospital refused to accept Rs 500 notes. to know that he can’t withdraw the money he loaned from his PF account. go to bank to deposit Rs 2000.
two Lok Sabha seats in the state. Party, West Bengal, in the afternoon, the second was made around 8pm. November 1 and Rs 1.25 crore on November 5.
forms a part of it. We issue receipts against the cash received. November 8 (date of ban). had spelt acute hardship for the poor. developing robust and adaptive strategies for the future. of rupees, which is serious money. investment, especially through investment havens like Mauritius. used to soak up black money. will affect how far we can push its Government to accede to our demands. question the residential status of a company there. Switzerland, whereas tax evasion is not a crime under their law. Administration. And this was all for the much-maligned UPA government. Hasan Ali Khan, the Pune stud farm owner with billions stashed abroad. and branch reform is necessary. measures needed to tackle corruption effectively. co-operate with such an endeavor. Supreme Court by the government. that in the list majority of the people belong to a particular party. 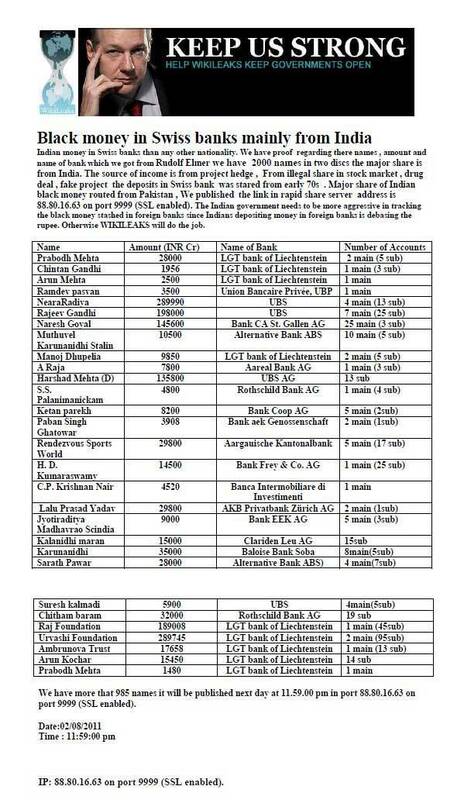 second list has BJP names. project hedge, illegal share in stock market, drug deal, fake project. rapidshare server, address is 88.80.16.63 on port 9999 (SSL enabled). banks is debasing the rupee. Otherwise WikiLeaks will do the job. 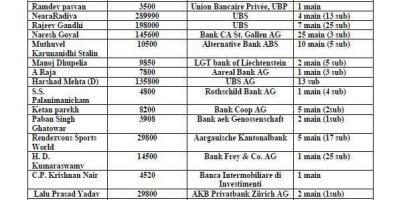 Here is the list of black money deposits of indians in swiss bank and other banks posted by wikileaks in website.